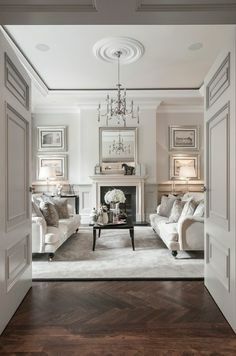 Here at LUXXU we love to inspire you with the most stunning interiors. Gather inspiration for your own projects with these modern interiors. 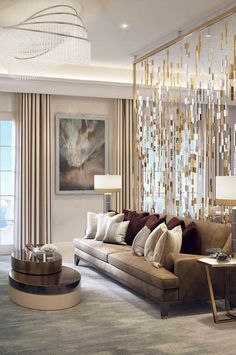 Whether you are working on a design project or you’re just looking for home décor ideas you will find the inspiration you need to make your interiors stand out with our sumptuous furniture and lamps. If you want to freshen up your home for this summer keep reading! We might just have the perfect idea for you. We have gathered inspiration for every room of the house, from the bathroom to the entryway, even the closet didn’t get left out. Follow our tips for a modern home! A perfect choice for entryways, halls or any blank walls you might have in your home. A brass and marble console, combined with a high-end stool and a round mirror gives an exclusive design to your home. A luxury home is filled with the most incredible interiors. 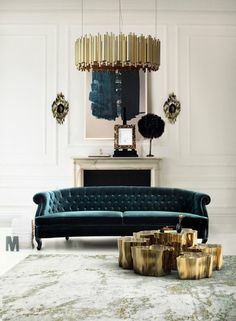 Black and gold furniture is one of the best ways to add a statement item to your room, especially is you select a gorgeous side table and place it next to a velvet armchair. Brighten up your bedroom with a stunning pendant lamp. Gold and blue together are the colors of royalty, pair them in your bedroom and you’ll feel like you’re sleeping at a palace. Bathrooms are often overlooked, but yours doesn’t need to be! A marble counter top and an equally stunning mirror can be the differentiating elements. Don’t be afraid to add seating to your bathroom for an extra touch. When it comes to the dining room it can be a little tricky to find the perfect balance between functional and modern. 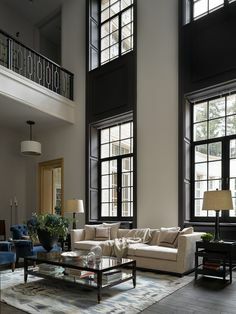 Our suggestions are that you choose comfortable chairs, a statement table that you will decorate around, a sideboard that provides tons of storage and decorative elements as a mirror and lighting. A modern luxury bathroom filled with gold details and exquisite lamps is a great choice for this room of the house. For a modern look in the dining room, you can always opt for some chairs with a unique design, a marble table (that is super on trend right now) and an exclusive lighting piece. The kitchen doesn’t need to be overlooked. You can make it as modern as you want, just make sure you choose the right color palette for you and select some modern bar stools and pendant lamps to put over your island. This dining room just screams Summer, doesn’t it? 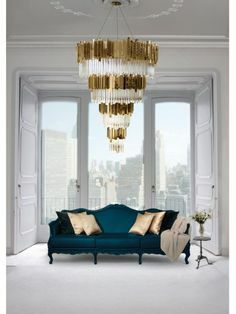 Pastel colors such as blue paired with gold and white give a modern look to any room while keeping it very fresh. And remember, consoles are great pieces, functional and beautiful, that work great in any interior. A lamp on the wall and one above the bed add a modern touch to any home.